Weekly Photo Challenge: “Converge” What’s on your tectonic plate? all over dynamic planet Earth. Gaze out on the Pacific Ocean. A good spot to fish, place for beautiful sunsets, where storms roll in, clouds? On the Oregon Coast, that’s what’s on our tectonic plate. with the North American Plate way beneath the ocean floor. the oceanic crust that forms the Juan De Fuca plate. slides beneath the continental crust. this geologic configuration is known as the Cascadia Subduction Zone. Subduction zones are of extreme concern by geologists. This is where deeper earthquakes tend to occur. The first 20-25 minutes are most critical for survival. Reaction time starts ticking when the earthquake commences. Then… it’s paramount to maximize those precious escape minutes. Cell phone app. Click on the image for more information. Collection of 131 maps show tsunami inundation zones. Two zones are depicted on area specific maps to illustrate (1) inundation in the event of a distant tsunami; and, (2) inundation in the event of a local tsunami, such as one originating from the Cascadia Subduction zone offshore. The maps also outline evacuation routes people can take to escape. The maps are available for free in PDF format. Click on the map icon below. Scroll down the webpage for a list of evacuation map-links for specific Oregon coastal communities. I like having opportunities to share this important information whenever the opportunity comes along. The phone app actually came in handy last summer on one of our camping trips. There was an alert due to a distant earthquake in Alaska. 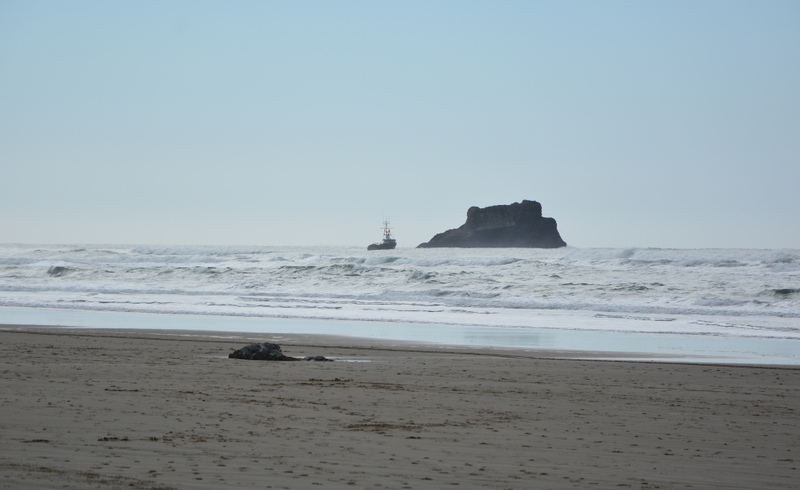 Nothing became of it on the Oregon Coast… but the park ranger was impressed when we asked about the status. He said they were keeping an eye on the reports; reviewed the evacuation plan for the park. We were happy to know tsunami monitoring is routine at Oregon State Park campgrounds! Agreed! That probably was in the time frame when you were out here. I recalled my last drive along the Oregon Coast and the signs warning I was in a Tsunami Zone. A bit unsettling to say the least. That is a very interesting graphic of the various plates and how they interact. Here where I live I can find places where over time curbs and fences have been offset by fault movement. A constant reminder, as you pointed out, that the land we live on is on the move. A geologist friend calls the dynamic earth- Beauty and the Beast. I think he’s correct. The Beauty is what keeps us here! Fantastic interpretation of the theme Jane, and such interesting background information! LOL!!! I didn’t even see that connection, Tina! But now that you mention it… that fishing boat does look very close to “converging” with disaster! Perhaps a different lens choice would have put that aspect of the photo in better perspective! I hope our tectonic plate isn’t converging too rapidly…neighbouring Armenia and Turkey both have a history of destructive earthquakes. I hope too that in Oregon the Cascadia Subduction Zone will not unleash earthquake forces anytime soon. I agree with you, Jim. Those are forces that we both would rather not experience! But, someday it will be inevitable as the process of Earth recycling itself continues. Learning about the geology of Oregon has always been a humbling experience… I would imagine you have similar feelings about the tectonics in your part of the world. After going on line, I discovered that your Earth dynamics include very active crustal-scale faults that trigger the earthquakes you referenced. Interesting that we also both live near lines of mountains with active volcanoes, the Cascades and the Caucasus. What’s on your tectonic plate differs from mine- astonishing to see your region is one of the few places on Earth where THREE continental plates converge- Eurasia, Arabia, and Africa plates! I have felt four small earth tremors in my life in Cyprus, UK, Greece and here in Georgia. Turkey, our neighbour, has had a few devastating earthquakes in recent history. I wouldn’t like to experience a large earthquake. For a small country (Georgia is the size of Ireland ), we have a rich geography, with mountains higher than any in the Alps, a semi desert area and the littoral landscapes by the Black sea. Oregon looks beautiful in photos with some spectacular National and State parks. On my only visit to the US, I only got as far west as Chicago…one day I’ll have to get over to the Pacific coast. If you do get to the Pacific coast… I wonder what similarities you will find in our landscapes.